Vector components are a must have for any designer! They’re the essential building blocks for our design projects. Having a quality library of vectors available whenever you need them is a huge time saver. Today we’re thrilled to bring you this vast new collection of vectors, which features the items that the Design Cuts community have asked for the most. These are the necessary elements that you rely on within your daily work. These vector elements are the ultimate time-saverEvery designer I know relies on component elements to build their designs. 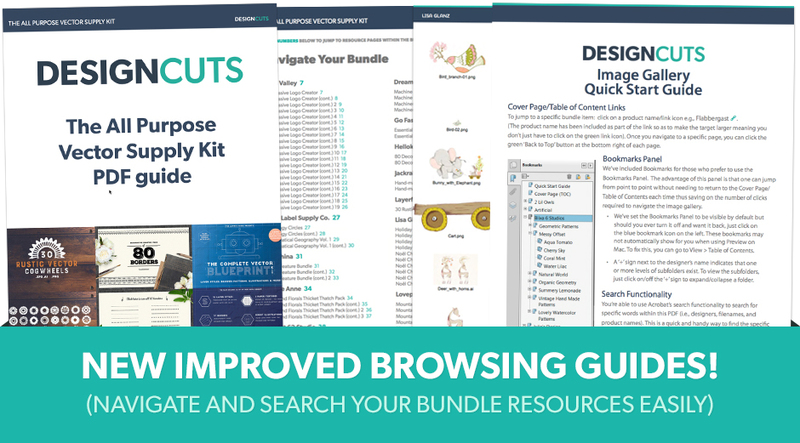 As useful as full illustrations can be (and this bundle includes plenty of them! ), it’s the isolated elements that we find ourselves relying on each day in our projects. This collection brings you an incredibly practical set of best-selling elements, including frames, florals, icons, badges, shapes, icons, silhouettes, textures, machine parts, artistic markings, sunbursts, labels, borders and more! It’s a complete solution for every designer, so whatever your next project, you’ll be able to dip into this collection and find the exact elements you need! With this collection you get quality, guaranteedAs well as bringing you a staggering variety of items, this collection also gives you incredible quality. We’ve teamed up with many of the best vector illustrators in the world, including Lisa Glanz, Offset, Artifex Forge and Skybox Creative. Every single element has been hand-tested for quality and carefully curated by our team. They’re beautifully put together, and wonderfully easy to work with. Best of all, as these items are such high quality, they will actually help to elevate the quality of your own projects. Create awesome work available for sale, backed by our extended licenseThis collection would cost you nearly $3000 at regular price! That’s partly because we’ve included extended licensing for each and every item, which typically doesn’t come cheap! By getting all of these popular items with a fully extended license, it means that you can use them within your own wider designs available for resale, from greeting cards, to posters and merchandise! I am so happy to bring you Noël – An Enchanting Christmas Collection! Filled with lovely whimsical delights, this set has oodles of Christmas goodies ready to add joy to your holiday projects. With over 180 items including Christmas animals, wreaths, patterns, snow globes, and much more, you’ll have all your Christmassy design needs sorted. And to make sure you have even more fun in the process, I’ve included all the snow globe items separately for you to create your own custom globe in no time at all! File format: All the elements are supplied in both vector and raster format (i.e. 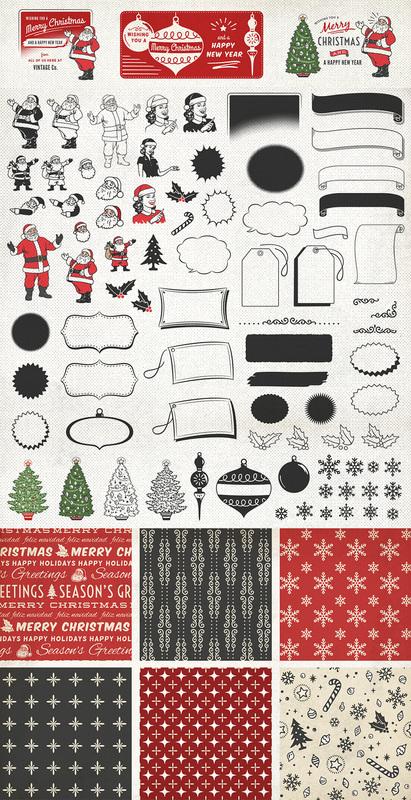 illustrations are .PNG; Patterns are .JPG; Pre-designed Christmas scenes are .PSD and .JPG). Software compatibility: Adobe Photoshop and Illustrator CS3 and newer. .PNG and .JPG files will work with most graphic software. My number one aim was to capture the magic of the season, which I hope I’ve achieved so you can incorporate that into your creations. I was also careful to include illustrations that can be used in and out of the Christmas season, making this set an all-year-round resource. File format: This set is available in both vector and .PNG format except the paper textures which are high-res .JPG files. The Massive Logo Creator: 950 Vector Elements, 132 Editable Premade Logos and 110 Textures for a total of 1040 items! This is our huge Logo Creator which features tons of elements that you can use to create professional grade logos. It includes all kinds of items in different styles: from mandala elements to simple and minimal or even feminine ones. This kit is for everyone! You can use this incredibly useful resource to create literally thousands of combinations in just a few minutes. We put months of effort into this big package so you could create any kind of logo instantly. Have a look at the sample logos in the preview images, the results speak for themselves! Photoshop & Illustrator – All the logo elements are vectors that you can use in either Illustrator or Photoshop so you can scale them to any size you wish. Combining elements is very simple and fun. Software compatibility: Adobe Illustrator or Illustrator CS2 and newer. Bonus Mockups will work with Adobe Photoshop CS4 and newer. This vintage logo pack has been made using my most recent customer feedback. It has been designed to be super useful, save you all time, and give you value as well as quality. 49 additional animals have also been added due to popular request. So here it is! Now the package arrived at 325 vector elements and 21 ready to use logo labels. Software compatibility: Adobe Photoshop and Illustrator CS4 and newer. 60 vector, handmade animal silhouettes for use in various design work. Includes a wide variety of animals from the Northwest, Farmyard, Desert, Savannah, Under the Sea, and even Prehistoric era. All silhouettes are hand-drawn and converted to vector format for design convenience. This pack comes with the vector .AI file, vector .EPS file, and as individual .PNG files (not vector). PNG files are 1000x1000px @ 300ppi. Software compatibility: Adobe Photoshop and Illustrator CC and newer. .PNG files will work with most graphic software. 25 vector, handmade vehicles for use in various design work. Each one is drawn and detailed by hand. Includes a wide variety of classic vehicles, modern vehicles, motorcycles and even a vintage travel trailer. All drawings are converted to vector format for design convenience. This pack comes as a vector .AI file and as a vector .EPS file. .PNG files of individual vehicles also included (non vector – 1000x1000px 300ppi). These are fantastic for logo designs, craft projects, t-shirt designs, prints and other merchandise. Use them individually or in combinations for different effects (view the screenshots for examples). Fully editable. Change the colours and scale them to any size you need without loss of resolution. • 30 individual letterpress symbols, supplied as Illustrator 8.0 .EPS files which are compatible with most vector and bitmap applications such as Adobe Illustrator and Photoshop. • A .PDF reference guide. Software compatibility: Adobe Photoshop 6 and Adobe Illustrator 8, and newer. • Each item is on a separate layer. • Simply place your photo or artwork on the bottom layer and select which layers you want to use by toggling the layers on or off. • Change the colours, scale them to different sizes, add or subtract elements and combine layers for different effects. • Simply place your photo or artwork on the bottom layer and select which items you want to use by toggling the layers on or off. • Each item is a vector shape layer so they can also be edited. Software compatibility: Adobe Photoshop 6 and Adobe Illustrator 8, and newer. .PNG files will work with most graphic software. A collection of 12 vector hexagon textures. These are great for craft projects, logo designs, photographic masks, printing effects, t-shirt designs and other product merchandise. Use them individually or in combinations for different effects (view the screenshots for examples). • 12 individual hexagon textures, supplied as Illustrator 8.0 .EPS files which are compatible with most vector and bitmap applications such as Adobe Illustrator and Photoshop. A collection of 10 vector wood texture. Software compatibility: Adobe Illustrator or Photoshop CS2 or newer. .PNG files will work with most graphic software. Deck your designs, illuminate your illustrations! Create dazzling designs with my astonishingly authentic fairy light brushes. They were sourced from genuine lights and use an innovative layered brush system to combine two types of brushes to great effect. Perfect for seasonal and celebratory projects! So how does a layered brush work? I’ve used a graphic style to combine wire and bulb brushes. You can apply the style to a vector shape or line instantly – there’s no complex system. New to graphic styles? – I’ve included extensive usage documentation (This feature is available for Illustrator CS5 – CC). Alternatively and for more flexibility, the two types of brushes can be used separately – this second method provides the opportunity to further customize your designs by individually rotating and placing each bulb for maximum realism (This feature is available for Illustrator CS1 – CC). You can even create mixed color combos. The bulbs come in twelve colors but I’ve included instructions explaining how to adjust them to create your own varieties. 12 Bulb Brushes and a Wire Brush. If you are a tablet user, you’ll be pleased to know that a version of the brushes with pressure sensitivity enabled is included. (Please note that this feature works in Illustrator CS5+). The one click layered brush system in twelve colors. Please note: the graphic styles are compatible with Illustrator CS5, CS6 and CC only. Easily create that classic blueprint look! The Artifex Forge is proud to present this all-inclusive pack, which contains everything you need to create your own vector blueprint designs – patterns, graphic styles, brushes, textures and more! I’ve always loved the look of blueprints, which are simply reproductions of technical drawings that document architectural or industrial designs and have been used since the 19th century. I find that the annotated elements really add to the design aesthetic, creating some interesting features which were never meant to be part of the end product but, by accident, give it a real sense of authenticity and life. With this product, now you too can bring this classic, dexterous feel quickly and easily into your designs! Transform vector text and shapes with these one-click effects. Simply select a vector and click on one of the 58 styles in the graphic styles tab. I’ve supplied them in white but instructions are included explaining how you can easily adjust the colors to suit your own design needs. 20 realistic grid and blueprint patterns are included. They are the perfect base to your blueprint design – use them as a background or to fill vector shapes in your main design. Each has a transparent background so you can add a color or gradient behind. They are supplied in white but I’ve included instructions explaining how to adjust the colors. This set of 37 Illustrator Brushes is perfect for adding that extra bit of authenticity to your designs. The range includes arrows, measurement arrows, dots and dashes and a border brush. A pressure sensitive version of the brushes is also included. Fold and crease overlays in .TIF format. These contribute to the pack’s realistic look. Simply place them over your design, set the transparency to multiply and adjust the opacity. The creased paper measures – 3508 x 2453 px. The folded paper measures – 6949 x 4950 px. I was having so much fun creating the screen shots for this project, that I decided to expand them into a mini illustration pack! All are vectors and can be edited as required. Software compatibility: Adobe Illustrator CS5 to CC or newer. 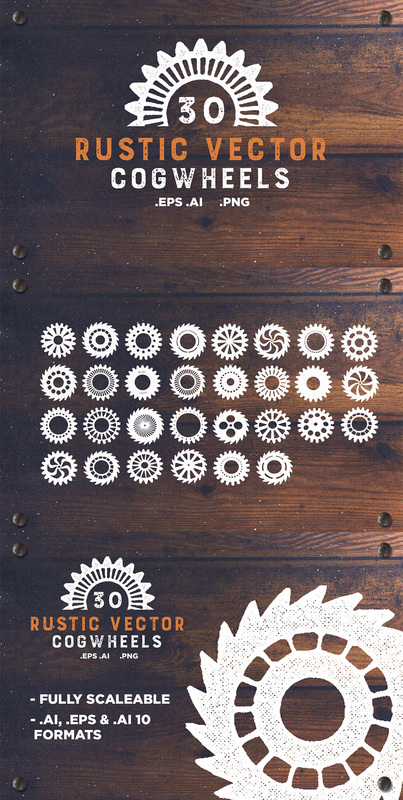 Introducing our latest Vector Pack, a set of 30 Rustic / Vintage Cogwheels, fully scaleable and perfect for vintage artwork and logo designs. Software compatibility: Adobe Illustrator 10 and newer. Files available in vector .EPS10, raster .PSD (very high resolution – over 20 mpx) and .JPG versions. Textures and backgrounds on separate layers. Machine parts and Dream Machine available in black & white / isolated version without fill. Software compatibility: Adobe Photoshop and Illustrator CS2 and newer. .JPG files will work with most graphic software. 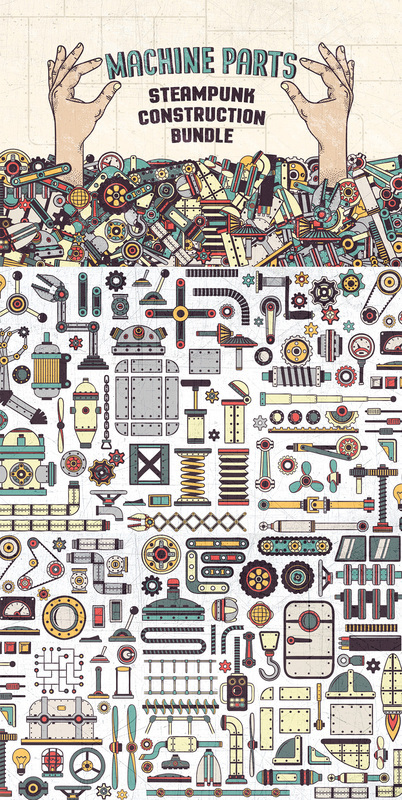 A big machinery construction kit with vector and raster versions. Perfect for use on flat designs, with the ability to design a fantastic and unique machine apparatus. More than 100 parts included. Software compatibility: Adobe Photoshop and Illustrator CS2 and newer. Ever wanted to feature your items, works or projects and seem to end up with a messy layout full of boring stuff? Those days are over! With this huge 152 Sunbursts pack, you will get an instant feature for your elements, shapes, or simple backgrounds. These are extremely easy to use, just drop one or a few of them into your Photoshop or Illustrator file, re-size them and put the item you want featured in front of the Sunburst/Starburst. You are done! These are so fun to use, and your work will inevitably look like a retro/pop/kung fu-esque Tarantino style awesome design. I have included 152 Vectors and 152 Photoshop Brushes for your convenience, and if you are like me, you’ll find yourself re-using these over and over again on all of your projects. Software compatibility: Adobe Illustrator and Photoshop CS3 and newer. Let’s face it, in this crazy deadline driven profession, we all need that handy, quick-access, folder full of amazing iconography at our fingertips, ready to plug into our daily design projects. I’ve carefully chosen to develop these particular icon subjects (skulls, robots, factories, gears, vehicles, etc.) based upon my constant need for certain specific topical visuals in my work. I’m confident that they’ll provide some stunning quick-fix solutions for you as well, saving you a bunch of sketching and render time! This initial set of vector-based iconography (built in Adobe Illustrator) is Volume 1 in an on-going series of bold, fun, hard hitting chunks of irresistible artwork you can drop into logo lock ups, badge designs, flyers, websites, invitations, etc. • Clean and Rough Versions! These grungy circular shapes were created by using black paint, paint brushes and Bristol board. Each shape was then scanned in and converted to vector format for infinite scalability. Use these as background elements in your illustrations, logos and other designs. I am also including the texture I used (my own photo) in the previews as an added bonus. Set the blending mode to Soft Light to achieve the effect in the previews or experiment with your own blending modes for different effects. Software compatibility: Adobe Illustrator or Photoshop CS1 and newer. Mathematical Geography is a branch of geography that deals with the figure and motions of the earth, its seasons and tides, its measurements, and its representation on maps and charts by various methods of projection. Sourced from a German book dating back to 1857, these detailed vector illustrations have rough edges that simulate a vintage, hand-drawn look and feel. 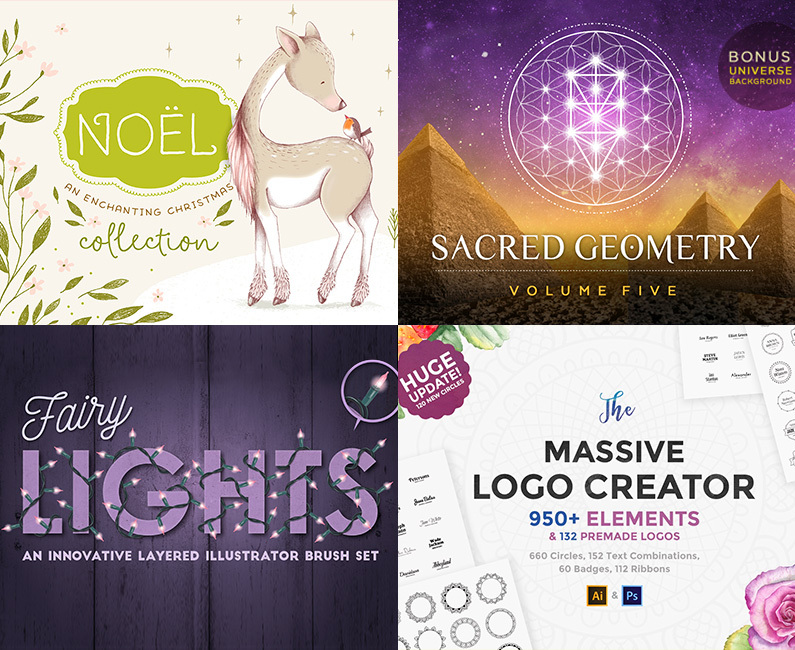 This Sacred Geometry Vector Set Vol. 5 comes with 9 new, completely unique handcrafted design elements! The diverse selection and subtle “star-connector” elements make these unlike any other product out there. Perfect for any design project you can dream up! All illustrations are vector-based and easy to modify with basic Illustrator knowledge. Software compatibility: Adobe Photoshop and Illustrator CS5 and newer. .PNG files will work with most graphic software. Introducing Our High-Quality Collection of 36 Plant and Flower Vector Illustrations – .PNG and .JPG Images Included! Our focus is to collect, restore and repurpose old and forgotten artwork for the modern creator and within this collection, you will find 36 detailed plants and flower engravings/illustrations that will be perfect for a whole variety of design projects; from logo design to apparel, from posters to scrapbooking and so much more (perfect for patterns too). If you do not have access to a vector based program, or simply want to open and work with these images quickly and easily, we have included 36 high-resolution (300 ppi) .PNG and .JPG images too! Software compatibility: Adobe Illustrator CS and newer. .PNG and .JPG files will work with most graphic software. Volume 7 contains 50 gorgeous illustrations sourced from rare vintage catalogues published in New York, United States in 1914. Software compatibility: Adobe Illustrator or Photoshop CC and newer. .PNG files will work with most graphic software. Volume 20 contains 50 handsome vintage illustrations sourced from rare retail catalogues published in United States, 1920. Volume 21 contains 50 gorgeous and rare illustrations of vintage goods – a great collection of retro lifestyle, sourced from vintage print published in Chicago, 1914. • All graphics made are verified to be out of former copyright, in-house personally collected and owned, hand-picked and reviewed in detail to make sure they are in the best shape for a contemporary project. 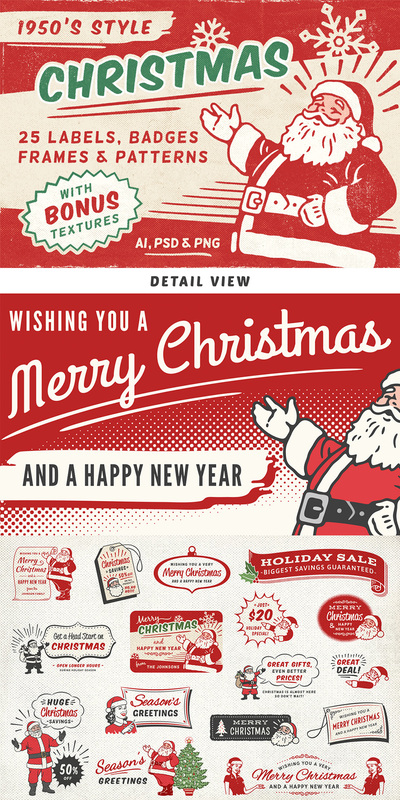 Retro Christmas labels, banners, frames and badges made in a mid-century print ad style featuring original illustrations, seamless patterns and bonus textures. This pack includes both Illustrator and Photoshop versions. 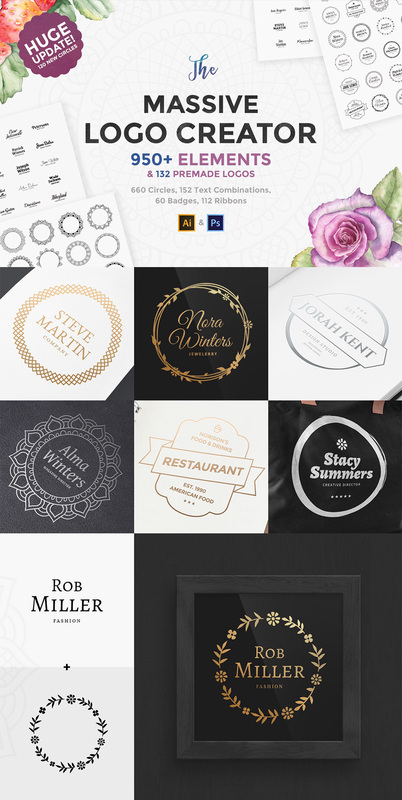 • 19 labels, frames and badges .AI version – all designs in one file. And each .PSD template is a very high resolution, layered .PSD file with fully editable text paths. Minimum size is 6000 x 2400 px. • 6 Seamless Patterns .AI version all on one file. .PSD files, 6600 x 6600 px. • 79 original elements in one .AI file. • 79 very hi-res .PNG files of each separate element with transparent backgrounds. • 10 Bonus Textures including paper background used on cover page and textures that we used to create the vintage print look for the previews. • Only free fonts used – a list of fonts used with download links is included. Software compatibility: Adobe Illustrator and Photoshop CS3 and newer. .PNG and .JPG files will work with most graphic software. Unio presents “Carosello – Huge Retro Ads Kit”! This hand-made kit brings back the style of the 1950s with vector quality! Create outstanding 1950s vintage designs or ads in a matter of seconds. Software compatibility: Adobe Illustrator CC and newer. Need borders? No problem! This big pack will be very helpful while creating wedding and bridal shower invitations, cards, patterns, web projects, postcards and more. Software compatibility: Adobe Illustrator or Photoshop CS5 and newer. .PNG files will work with most graphic software. A pretty set of frames & label shapes perfect for all sorts of creative projects. Software compatibility: The .EPS files will work with Adobe Illustrator and Photoshop CS and newer. .AI files require Adobe Illustrator CS4 and newer. The Thicket Thatch illustrated graphics pack was inspired by the mountains, and the wonder and adventure found in the thicket of the forest. 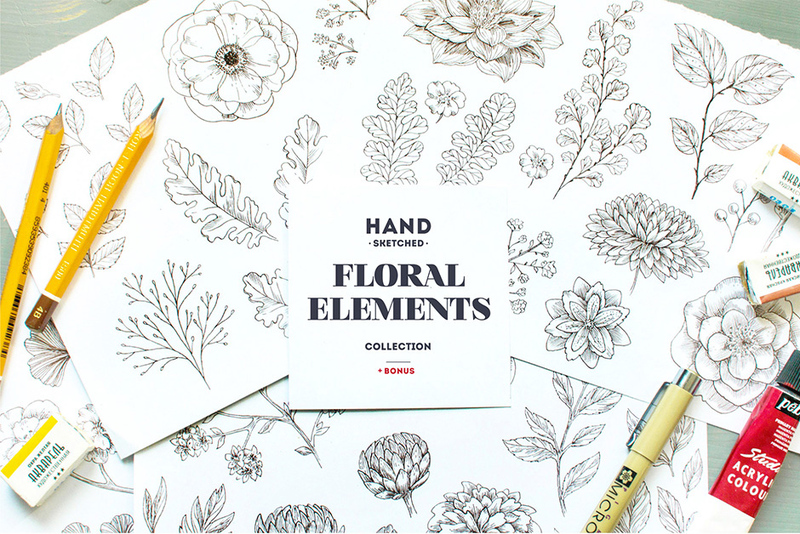 Combine these hand-drawn floral elements and create lovely bouquets. There´s a lot of possibilities! Great for vintage wedding invitations, cards. Please note the fawn is not included in this collection. Software compatibility: Adobe Photoshop and Illustrator CS2 and newer. .PNG files will work with most graphic software. Hand drawn nautical bundle contains all you need to create trendy navy logos/invitations/greeting cards/branding identities/labels/badges/ banners/prints/patterns and whatever else you can imagine. Software compatibility: Adobe Photoshop or Illustrator CS3 and newer. .PNG and .JPG files will work with most graphic software. This bundle offers huge variety of quality, unique vector elements, including rustic shapes, seasonal vectors, industrial elements, decorative flourishes & florals, textures, logo packs, geometric shapes and much more. File size is approx 3.2GB (12.11GB unzipped), split into 22 parts - one link per designer or an optional one click download. A .PDF guide has also been provided for easy browsing. Is anyone else having issues with the Alien Valley logo creator? I cannot change multiple elements within one logo i.e. the entire logo changes to green when I have only selected one part for the color change. Also, the files hesitate and slow down Illustrator. What am I missing? Thanks! I would like to buy ‘Ornate decorative frames’ in this kit. Please let me know if you still sell it or similar one. I confess that I was disappointed that Mia Charro’s pack did not include the deer that was so prominently displayed in the images for it. Thanks so much for your comment and I am really sorry for any disappointment caused with this! Thanks for your comment! I’m really sorry but I’m afraid that this bundle is completely expired now so I’m no longer able to set you up with this. My apologies for any inconvenience caused! I hope this helps, Giang, and please don’t hesitate to contact me should you have any other questions. I’m here to help! Nevermind.. I just saw the comment above.. there’s no way I’d be able to afford at full price. ugh. oh well. Looks like a missed the deal as well. Would really appreciate being able to get in on this package if there is still an opportunity. I hope this helps, Cody, and please don’t hesitate to contact me should you have any other questions. I’m here to help! I need to do the restyling the site of my society. I’m sure that in this deal, I will find many fabulous graphic elements! I missed the deal as I was on vacation any chance to pick it up?!?! That would be perfect for holiday! Thank you for your comment. I’m really sorry to hear that you missed out on this bundle! Rest assured, I can certainly assist you out with this 🙂 I’ve just sent you an email to help get you back up and running again. I hope it helps, Nick, and I hope you had a great vacation! AGH!! I missed it!! Can I late purchase too?! Pretty pretty please with a vector cherry on top!? Thank you for your comment! I’m really sorry to hear you missed out on this one. Rest assured, I’m here to help 🙂 I’ve sent you a quick email to assist you with this. Somehow I totally missed this deal! Any chance of somehow picking it up?!?! Hey guys, I didn’t make it and I couldn’t buy it. Is there any other way to buy this bundle? Thank you for commenting! I’m really sorry to hear that you missed out on picking up this deal. Not to worry, I’m send you a quick email to assist you 🙂 I hope it helps, and please don’t hesitate to contact me should you have any other questions. I’m here to help! Oh no! I missed this one, any chance to still purchase? Thank you for your comment! I’m really sorry to hear you missed out on this bundle but rest assured, I’m here to help 🙂 I’ve sent you an email that should help get you back up and running again. I hope it helps! Shoot! I missed out on this one – Were you able ot help Amy, above, or will there be any chance it’s offered again? Great bundles, by the way, I love the work you showcase. Thanks so much for your comment, I’m really sorry to hear you missed out on this deal! Unfortunately we will not be re-running any of our expired deals but rest assured, I can certainly help you out with your query 🙂 I’ve sent you an email to help get you up and running again. but I missed out too. might you offer it again?! sorry, I can’t speak English enough. Thank you kindly for getting in touch! I’m really sorry that you missed out on our All-Purpose Vector Supply Kit! This bundle has now expired but rest assured, I’m here to help 🙂 I’ve just sent you an email to assist you with your query. I hope it helps! Thank you for your comment! I’m really sorry to hear you missed out on this deal. I’m sending you a quick email to assist you with this 🙂 I hope it helps! If you have any questions or queries, please do let me know. I’m always happy to lend a hand! To sum it up: I love it! Thank you for being this great :). Thank you again for your support, Jackie. It really means the world to me & the team 🙂 If you ever have any queries please do let me know, I’m here to help! I have a question! If I were to purchase this bundle, can I use it for work too? I hope this helps, Esther, and please don’t hesitate to contact me should you have any other questions. I’m here to help! Hey guys just wondering if this bundle will work with easy cut studio ? I would like to purchase this package for cutting with easy cut studio. Thank you for getting in touch, I’m really sorry but I am afraid that we do not work with Easy Cut Studio on our side so I’m unable to test this out and confirm for you! Not to worry, I’ve sent you a quick email to assist you further with this 🙂 I hope it helps, and please don’t hesitate to contact me should you have any other questions. I’m always happy to help! Thank you and thank you for your tutorials too. Thanks again, Susan! If you ever need assistance with anything, please do let me know. I’m here to help! I was considering starting a business next year, and design elements were at the top of the list. Now that I have seen this I don’t think I can pass it up. Just about all of the design elements I need and more are here, and I’ve come up with so many ideas just by scrolling through it. Whoever came up with this bundle is a genius. I will definitely be back. Thanks again for your lovely feedback, Kimberley. We really appreciate it! If you do have any questions or if there is ever anything I could assist you with please do get in touch. I’m always happy to help! Thank you so much for your feedback. I am so sorry to hear that this bundle would not be a good fit for you! We always welcome suggestions and feedback from our community members about what resources they would like to see and we received a huge number of suggestions to help shape this pack but if you are looking for a different style of resources, please do not hesitate to send me some links and I will do my best to source them for a future deal. Apologies again for any inconvenience caused, Thiyagu. Rest assured, we will certainly do our best to make sure our future bundles are a much better fit for you 🙂 if you have any other questions or queries please do let me know. I’m always happy to help! I think my English was poor. This is fantastic collection, and I am going to buy this package. Even I was not yet started to download my earlier package. Can you understand my words. Once again sorry for my earlier comment that gives negative meaning. Thank you so much for getting back to me and for clarifying for me. I’m sorry for any confusion on my part but it is fantastic to hear you really like this bundle 🙂 Thank you for your kind words! I hope this pack makes an awesome addition to your creative toolkit! If you do have any questions or if there is ever anything I could assist you with please do get in touch. I’m always happy to help! Is there anyway you could link the cover image of the deal overview to the items contained in each kit? It would be nice to jump directly to an item of interest instead of scrolling through the entire (awesomely enormous!) collection. This would be really helpful once you’re ready to download files too – sometimes it’s hard to remember where you saw an element in a previous bundle. Thanks again for getting in touch with your feedback, Sheila! We hope you are enjoying working your resources and if there is ever anything I could assist you with please do let me know. I’m here to help! I’m a graphic and Web designer, i just bought this Bundle. OMG i love it!!! It’s just amazing. Really. Thanks you soooo much!! Best bundle i ever bought. Really. Tumbs up!! Thank you so much for your incredibly kind words! 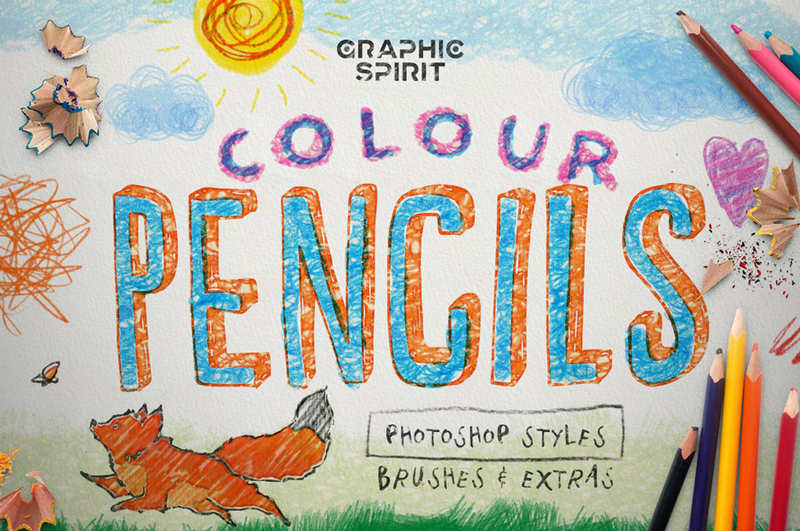 We are so pleased to hear that this is the best bundle purchase in your eyes 🙂 We hope these resources make a fantastic addition to your creative toolkit! Hey guys just wondering if this bundle will work with Affinity Designer? Thank you kindly for your comment, I am really sorry but I’m afraid that we do not work with Affinity Designer on our side so I’m unable to test this out on my side and confirm this for you. I hope this helps, Wei, and please don’t hesitate to contact me should you have any other questions. I’m always happy to help! It’s been almost THREE MONTHS since I have bought a bundle, and I own THIRTY! I’ve here every other Tuesday refreshing, hoping there’s at least something I want or don’t have already. I LOVE you DesignCuts, your business model is amazing. but lately the content in your bundles have been nothing but watercolor vintage flower animal doodle patterns, and if you’re lucky there might be a ‘cute’ purposely-messy ‘calligraphic’ font set in ‘hot foil’ (I only have a few dozen already!). I don’t sell trinkets on Etsy, I design for local businesses of 100 different industries. The selection is getting stale and doesn’t serve the taste of even 20% of my clients. FONTS were always your main pull. A great typeface can be used in a million different ways. When you guys do fonts you never fail. TEXTURES/PATTERNS/BACKGROUNDS are a main part of any design. But if all we ever get are vintage grunge, watercolor splashes, silly doodles and animals, I won’t need to ever buy again; I have piles of them from previous bungles, while I lack more basic and universal ones. We have tons of bokeh blurs, geometric triangle compositions, weird 3d model explosions, texture maships to layer on photos from 2lilowls, and ‘motion’ backgrounds. So many! TOOLS for photoshop were often well sourced and had great effects. They just became too few and far apart, with constant overlapping in what they produced. MOCKUPS were already a great example of a tool with purpose in many industries, as long as they are the more open ended ones like Scene Generators. I used to buy just about every bundle, and I still want to throw money at you guys, but I need something I can use! I feel bad about the 1 star review, but this needs to turn around. The industry trends go one way and we’re stuck going the other buying things that haven’t been new in almost a decade! Thank you kindly for getting in touch with your feedback about our current bundle, the team & I really appreciate you taking the time! Firstly, thank you so much for your incredible support with your 30 purchases! That is absolutely amazing and we really hope that your purchased resources have made an excellent addition to your creative toolkit. We are so sorry to hear that our latest bundles have not been the best fit for you and your projects. We always take our community member’s feedback on board as much as we can to help shape our bundles and we received a bunch of requests for this particular one! I’m really sorry that these resources will not work for you in your client projects. Rest assured though, we will certainly look into providing more items better suited to you! I have passed your comments on to our bundle curator team but if you’re looking for any particular resources that would be a better fit for you and your projects please do not hesitate to send me some links and we will do our very best to source them for you. Once again, our sincerest apologies for this inconvenience, Stefan, but thank you so much for your feedback. If you have any other suggestions for future bundles or if there is ever anything I could assist you with please do get in touch. I’m always happy to help! This is fentastic collection, and I am going to bye this pakage. Even I was not yet started to download my earlier pakage. IS THERE ANY WAY OF HOOKING ME UP WITH THE BUNDLE THAT JUST PAST????? I WAS AWAY WORKING AND COULD NOT PURCHASE IT IN TIME!!!!!!! I hope it helps, Neil, and please don’t hesitate to contact me should you have any other questions. I’m here to help! Aaaarrgghh….now you made me buy ANOTHER bundle!! 😀 Too good to refuse…so much wonderful stuff. So much for my strong willpower… Thanks everyone for your great bundles! Aww thank so much for the incredibly kind words and for another purchase! It would be great to have a more masculine themed pack. I love the cute drawings, watercolors and florals myself, but I do a lot of designs for the outdoor enthusiast that likes rougher, sharper, techie stuff. Some of the items in this pack are definitely closer than most of the other bundles – keep going! Thanks so much for the awesome feedback and suggestion! Rest assured, we take all our communities feedback and suggestions on board and will use them to work on improving our deals to better suit our community’s needs. If there was ever anything else you’d love to see in an upcoming deal, please do let us know we’d absolutely love to hear it. Wonderful selection of assets. Particularly impressed with the seasonal ranges. Thank you so much for the awesome feedback and for your purchase! Another must-have bundle! Seriously guys – how DO you do it? Outrageous price for so much awesome stuff (in a good way)! I am working on a Save the Date card for my cousin’s daughter and the florals will be just perfect for what she wants! And the holiday things will come in handy as well. Well pretty much all of will – the ideas are exploding in my head! Nice vareity. Like a few others mentioned, I don’t have CC either – I’m still on CS5 and 6 depending on which computer I’m using. Hoping to get upgraded at work at least, but for now won’t be able to use those options. I like the ones that work with the older versions of CS. Still, most of the bundle will work. It’s good that they at least tell which versions they do work with. Another fun bundle at a spectacular price! I haven’t even scratched the surface of some of the past bundles I’ve bought! I’m glad you are now including the very well done overview documents – I’m printing those out and putting them in binders so I have a better idea of what all I’ve got. Thanks! Thank you so much for your wonderful comment and your Save The Date sounds awesome- i would love to see your finished piece! I need to start working on my own ones soon but I keep procrastinating on them :). You are totally right and the majority of this bundle will work for you with your compatibility including the florals so hopefully you will get loads of use out of most of the bundle! What a clever idea as well with having the print outs- I do something similar myself but instead of a hard copy, I use Pinterest and have the items on mood boards for quick scrolling! Fantastic bundle. I need some help, I try to color in black vectors in Illustrator and nothing changes? I try the swatch panel and everything. Can someone tell me what I am not doing correctly? Thanks for the comment and we are so pleased that you are enjoying working with this one! Rest assured I can help you out with changing your vectors colours and I have emailed you over a tutorial which should help :). However if you do have any questions, please do let me know! Fantastic! Love the guide for reference on where to find things later. What a boring bundle this time.. there is not…. Bwahahah who am I kidding, this vector bundle f#”€€#” rocks! This comment has done me in for laughing! This is amazing lol :). I am so happy that you are loving this one and get loads of use out of it- I would love to see what you create Thomas so please do feel free to share any of your work! Have a ball working with this one and thank you, as always, for your support! We are so pleased that you like this one and we hope you get loads of use out of it :). You had me at Lisa Glanz! 😀 And ohmygoodness, I love Dream Bike Shop’s machinery – so much inspiration there! Artifex Forge’s Blueprint Kit is awesome… except that I’m not sure I can use it, as I confess I’m one of those stubbornly holding out against CC 😛 .I wonder: if we get down on our knees and beg for a version that’s compatible with CS6, would our wish be granted? >> Keeping fingers and toes and eyes crossed! Either way, this is yet another must-grab bundle… thanks so much, DC! I hope you are keeping well and thank you as always for such a lovely comment! We always hope that the bundle will inspire our community and it is so lovely to hear that this one is sparking inspiration for you! Unfortunately you are correct and you wont be able to work with the Blueprint Kit but I will join you in crossing everything for an update :). I’m kind of a rookie in graphic design and use Pixelmator. This bundle looks great, but will the files be .psd or .ai? I want to make sure I’ll be able to open them in Pixelmator (which supports .psd). I think I’m just going to have my clients start writing their cheques to you guys. Another fantastic bundle! Super excited about the lights in particular, but really…everything looks awesome and I can’t wait to use this stuff in my upcoming projects! We are delighted that you are loving this one and I would love to see what you create with the lights- if you were keen to share :). Hopefully you will get tons of use out of the bundle! As I mentioned to Pete, the good news is that the majority of this bundle doesn’t require CC so you should be able to work with most of the bundle. If there are specific brushes you would love to see in a future bundle please pop me over some links and we can work on getting them featured for you! We love to try and make our bundles as bespoke as we can and this bundle came about from community suggestions so please do let me know :). This is a very nice package with a lot of variety. Unfortunately, I still haven’t made the plunge into Adobe Creative Cloud, so I would only be able to use the elements that are compatible with the software I have. Thanks for the comment on this one and that is awesome to hear you like the variety in this one! 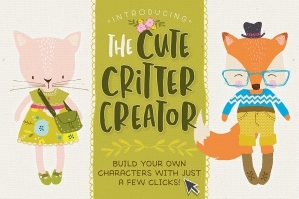 The great news is that the majority of this bundle will work in other platforms other than CC- there are only a couple of items that are CC compatible only and they are Jack Rabbit Creative’s Animal Silhouettes and Vehicle Pack but these come with PNG’s as well which should work in most softwares for you. The Vector Blueprint Kit is CC only though and also Carasello’s Retro Ads Kit would also require CC. You guys knocked it out of the park with this one! Phenomenal pack!! <3 <3 Everything I love in one!! We were really excited to get this one launched as it has those lovely festive treats in and we are getting some serious love from the community on it! We are so happy that you like this one Danielle and please do feel free to share anything that you create with your new resources as we would love to see what you are working on! I bought it especially and solely for Lisa and am thrilled with all of the other goodies too! What a package and what a great price, thank you! Thanks so much for your awesome feedback on this one! We are delighted to hear you are loving Lisa as well as the other resources in this one and we hope you get loads of use out of your new items :). Hey guys – great pack as always. I have a comment though – I find the American/Canadian animals in the packs and logo makers quite repetitive and not particularly useful where I am based. I’m in the Southern Hemisphere and we don’t get bison, bears, elk and those kinds of animals. Is there any way you help us out with maybe animals or birds that are native elsewhere. Such as wild life from Southern Africa, Australia, New Zealand, South America, Southern Asia etc. Just a thought! Absolutely, we can look at sourcing more of these for you 🙂 this is some really great feedback and we super appreciate your honesty. Yes, that is a good idea about the different animals. I was just thinking, how good would it be to see a kangaroo!! This would be super cute and is a fantastic idea! I have created Kangaroo vectors in the past for work that I have done. Maybe I should see if im any good at making kits, have a lot saved I have done. I’m going to second (or is it fifth now? lol) this comment; in fact it’s something I’ve been thinking about in general lately, not just for DC bundles. It’s understandable given the population difference, but there is always a focus on Northern Hemisphere seasons and animals, particularly American. It’s all winter, fall, thanksgiving, snow, leaves, snowmen, bears, deer, baby it’s cold outside, mittens, hot chocolate. It’s just irrelevant to me, being Australian, when I spend Christmas day sweating in 40 degree heat and swatting away flies. When I want resources for spring, or finishing up the school year, the vast majority of designers offer the opposite. I know that’s where the majority of the demand is, and you still see it everywhere in the shops here too. I hope this doesn’t seem too critical, because the Christmas elements included here are still gorgeous and useful and there’s so much other stuff too – it’s more just a general comment/observation from what I’ve seen on various design sites lately, and it applies at other times of the year as well. More on the topic of this particular bundle, I love it, and once again DC are mind readers – I was just looking at the Artifex Forge’s Christmas fairy lights and thinking how great it would be for Christmas (and not even hemisphere specific! ), and I’ve been drooling over the Thicket Thatch florals for a while now – such a fresh style and colour palette. And of course, anything by the wonderful Lisa Glanz makes it pretty much a must-buy for me; so much from those Christmas packs will be useful even at other times of the year and the snowmen are so cute it makes me not even care if we don’t have them here lol. Sorry that was a really long comment! I am so sorry that the resources you’ve come across lately wouldn’t really work for you! I love the idea of having a Kangaroo in a Santa hat or something similar! We super appreciate you taking the time to let us know what else you’d like to see! Rest assured I have popped your suggestions over to our Product Curator- Lizzy and she will definitely keep her eyes peeled for more specific items to you. Rest assured I have popped your suggestions over to our Product Curator- Lizzy and she will definitely keep her eyes peeled for more specific items to you. This is really great feedback Shirley and if you do come across any of the specific items you are looking for, please don’t hesitate to send me some links so that Lizzy can start working on these. I think it’s time for you guys to work on a feature where you automatically just take $29 each two weeks. It’s not like I’ll ever open the bundle page and not want to buy the bundle the moment it get’s out. You guys have reached a level of awesomeness where everything you offer is great and a “catch”!! Thank you so much for all your work and the opportunity you offer us! I mean, wow. Thank you so much for the awesome comment! I hope these new vectors will make an excellent addition to your creative toolkit and that you’ll have so much fun woking with them. Oh and P.S. some lovely generic stock photos would be awesome in a bundle. Overall I try not to use them but sometimes they would be really handy and they are so expensive. I agree with April. Stock photos would be a great addition to any bundle!! Stock photos would be AMAZING in a bundle! I have to admit, I did have a little giggle when I saw that you’d come back in after your initial comment, saying that you wanted to wait 😀 thank you for your purchase! I really hope that you’ll love your new resources! I can usually hold out several days and finally give in. Today, I managed to make it to the massive logo kit and totally lost it! This is an awesome bundle!! Lisa Glanz is amazing all by herself add in the logo kit? And wow!! Everything is just icing on the cake. I do have question about the logo creation kit. Does the license allow usage of the circles (and other shapes) as background images or can they only be used in a logo? After adding color and/or texture those circles they would look great as a background for some of Lisa’s graphics. After I finished my download, I realized I didn’t rate the bundle. Since it’s one of the best bundles so far it’s an easy 5 star! So excited! I can’t wait to play. Oh thank you for your incredibly kind words! Thank you so much for your continued support, I cannot tell you how much the team and I appreciate it! I have just popped you over an email with regards to your licensing query as I want to get some more information from you on this one. I cried (really, I did) when I missed Lisa’s deals during Design Cut’s birthday celebration. But, Happy Birthday to me (really, it is) – Lisa is in the mega bundle! I’ve been eyeing the little girl Christmas bundle for awhile. It’s all perfect! Aww, I am so sorry to hear that you missed out on the birthday discount! Thank you so much for your kind words, I really hope that you’ll love all that’s included in this bundle. Another solid instabuy! Wow you guys – just… wow. I mean, you had me at “Lisa Glanz” (she makes the most charming little characters! and that snow globe creator!?!? EEEK! ), but add in all these other astounding vectors and resources!?! I’m seriously going to have to clone myself just to find a way to use everything I love in this bundle. Amazing work – thanks so much for bringing this together for us all! Yay! Thank you for such an amazing comment! Thanks so much for your support, it is really appreciated by us all here at DC. Once again you all have checked items off the top of my wish list. Happy “new bundle Tuesday”! Wow, world famous bundle crafter!? Thank you so much! I am so glad that your loving this one as, I know you have high hopes for the vectors 😀 as always, thanks so much for the speedy comment and extremely kind words.